-This art of blue pottery making mainly uses Egyptian paste and dough obtained by blending quartz stone powder, powdered glass, Multani Mitti (Fuller's Earth), borax, gum and water. It does not use clay and is glazed and low fired and hence very fragile and brittle. The blue pottery is featured by a semi-transparent character which is mostly decorated with motifs of birds and animals and used in making products like ashtrays, vases, coasters, small bowls and boxes for trinkets though originally it was used to make urns, jars and pots. Once the Mughals started to employ the blue pottery technique in India to imitate various structures the art of the blue glazed tiles was developed outside an architectural ornament to Kashmirian pottery makers. Then it slowly entered into the plains of Delhi and finally by 17th century the art was captured by the artisans of the pink city, Jaipur. -There are also other resources which states that blue pottery made its entry into Jaipur only during the early 19th century under the reign of Sawai Ram Singh II (1835 � 1880) who sent his artisans to Delhi to get trained and learn the technique involved in the art of blue pottery making. There are a number of model structures still in Rambagh Palace where the fountains are lined and adorned with blue tiles. There are also records which state that decorative tiles made by the art of blue pottery was used in the construction of Jaipur city. But however by 1950 the art was totally washed out from the city of Jaipur only to be reintroduced by the efforts of the muralist and painter Kripal Singh Shekhawat with the help and support of his contributors like Kamladevi Chattopadhaya and Rajmata Gayatri Devi. Today it has become a big industry where it provides livelihood to many people in Jaipur and a very good source of income for the government of Jaipur.Thus now according to the latest trend the items or the products manufactured by the artisans keep varying. 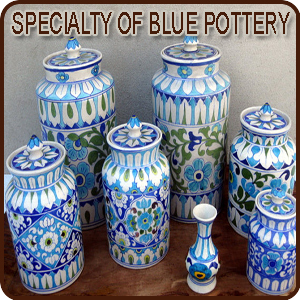 -The art of blue pottery is the only technique which is produced without the use of clay whereas with the blend of quartz stone powder, powdered glass, Multani Mitti (Fuller's Earth), borax, gum and water. This is essentially an imported techinque including the Chinese glazing technology with Persian decorative arts. Unlike the making of other pottery ,the raw materials mainly the compositions like quartz, raw glaze, sodium sulphate, fuller's earth locally known as multani clay which are used in this process all require the same temperature and has to be fired only once which is not the same with other potteries. The blue pottery item being fragile and brittle is easily broken once dropped down but however in the course of its usage and handled properly it does not develop any crack and is impermeable and hence more ideal and hygienic for routine use. -Only the neck and the lip are shaped on the wheel and the rest of the decoration and ornamentation is done with the help of a brush made from the hair of the squirrel and this is made by the painters themselves. All the items got by this technique are semi transparent which are mainly designed with intertwined flowing patterns scattered with motifs of birds and animals. There are a wide range of products which are got by this method and they include urns, jars, pots, vases, tea sets, cups and saucers, plates, glasses, jugs, ashtrays and now even napkin rings. The most common color used is blue which is derived from the oxide of cobalt, green from the oxide of copper and white, though occasionally yellow and brown are also used here and there. The Kashmiri potters take the credit of using this blue glazed tiled work for more than just architectural accessories. it is very difficult to make identical replicas of any product. There can be no identical pieces for it is very difficult to be fully sure of what the final product will really be like. It takes at least 15 to 20 days to finish the products for it is very time consuming, tedious and quite expensive. It usually ends up with a pattern which may not be exactly similar to what was planned originally. This is one of the main features which keep the craftsmen interested in continuing to keep this craft alive. -The color got from cobalt oxide is used to draw the outlines of the design and the colors used in filling the rest of the portion is got from other metal oxides. Cobalt oxide provides the color blue, copper sulphate provides turquoise blue, chromium oxide provides green, cadmium oxide provides yellow and iron oxide provides brown. Most of these craft items are mainly designed based on animal, plant and flower motifs. The other big center only next to Jaipur which is associated with blue pottery craft is Kot Jewar which is about 60 km away from Jaipur and it comes under the Tehsil of Dudu and post Boraj. Nearly 300 families living in this town practice the craft of blue pottery. Blue pottery items are ideal for gifts and souvenirs. -This art functions mainly based on ground quartz and is very tiresome and is a time consuming process. Once the items of the blue pottery are made they cannot be reworked. These doughs are then pressed into moulds and even before it goes into the fire they are hand- painted with oxide colors dipped in clear glaze and fired once in wooden kilns. Because it is quite tedious the artisans never take the extra step to try out new things with this process and hence its practical use is very limited. The entire piece should be done with great care for otherwise even a small mistake will lead to the piece either cracking up or turning black. The making of blue pottery involves four main steps and they are Pottery Making, Designing & Painting, Glazing and Firing. The individual ingredients required for the process is first made into small particles by crushing them. The raw materials mainly include green glass, Fuller's earth, Banyan tree gum, and quartz which is then ground in a traditional grinder called chakki. Once they are ground then they are weighed and fixed in proportions. Then the measured and powdered ingredients are blended and kneaded with water and is available in the form of dough which is kept in a plastic bag to retain moisture. The dough is then flattened with a traditional wooden tool known as thepai is used. The dough is set into open moulds and the edges are trimmed with a knife. Then these moulds are filled with ashes so that deformation does not take place and once it is set then the ash is removed and the mould is lifted. Now again the sides are smoothened manually and finally with the help of a sand paper is polised . Now the white paste which is got from mixing quartz, flour and glass is coated on the pottery. -The next step involves the designing and painting of the pottery where a potter's wheel is used to draw the design and is manually done. The oxide colors are made by grinding colored stone with a �silbatta� and then to this mixture the gum is added. Then painting is done on the pottery with the help of brush got from the squirrel's hair. The process of designing and painting is followed by glazing which requires glass, borax, and lead oxides. The ingredients required for glazing are kept inside the kiln and are dripped out into the cold water from its bottom. The glaze then got in the form of molten state is collected as lumps and made into fine powder. This fine powder is then applied to the product which is ready to go into the fire. The kiln which is used in the final step is the traditional method where the potters worship and make offerings to their family deity for the success. Once the kiln is ready the pottery is arranged in it with care. -Now the kiln is fired with the help of wood or coal and is kept in fire continuously for 8 hours so that the temperature reaches above 800 degrees centigrade. Now once it is done, the kiln is left to cool for at least three days and only after that the finished products are removed from the kiln. The first Institute to be started on blue pottery was by late Shri Kripal Singhji where people were taught about the withering away craft. Not only the local people but also artists from different parts of the country came here to learn the craft of blue pottery. This craft is not community specific but however a major number of artisans involved in this craft come from the Kumbhar or the potter's community. There are nearly 200 families in the town of Kot Jewar and 20-25 families in Jaipur practicing this art. Apart from the Kumbhar, the other families who practice pottery belong to Kumawat and Prajapati caste. Because of the increased demand for the blue pottery items, people in the nearby towns of Jaipur like Sanganer, Neota, Delhi and Khurja have also got themselves involved in this craft. -In spite of the demand from the local market there are other challenges faced by the artisans in the international market because the production quality is not very appreciable and competitions from other types of potteries exist. There is no standardized measurement for the ingredients added in the making process and hence there is difficulty in maintaining records. Further, there is no standard method for preparation of dye; few skilled artisans know the technique of making dyes and growing moulds. Dye- making is a long and difficult process. In order to make a big single pottery, it requires different types of moulds. The drying of the pottery is based on the sun and in the rainy season the artisans face lot of difficulty. Blue pottery is facing a strong competition from the Khurja Pottery. At the time of exhibitions the artisans find great difficulty in marketing their products because mostly they are uneducated and not aware of the existing trends. -Few surveys conducted on this craft has come up with awareness to be created about Geographical Identification (GI) mark for these products in exhibitions and other places to help them build and retain their identity. 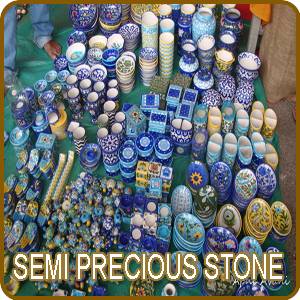 However these artisans are now coming up with different products like flower vases, cylindrical jars, plates, small bowls, ashtrays, essence holder, lamp stands, coasters, mirror frames, soap dishes, paper weights, T-light holder, photo-frames, napkin rings, boxes for trinkets, beads, ear rings, knobs, hangers, decorative wall hangings, games, cups, mugs, tea sets, snacks tray, glazed tiles and games. Leela Bordia started a company named Neerja International with the basic objective of doing good for the Blue Pottery craftsmen.Leela Bordia has traversed these last 3 decades to instill smiles and self reliance abilities in the small villages in and around Jaipur District. -Today, Leela Bordia and her firm Neerja International are synonymous with the name of Blue Pottery objects. She has not only reinstated this intricate craft back to its lost glory of the yester-years, but has also been the originator of innumerable new and innovative Blue Pottery articles. The rate of these products vary depending upon work and size of the product, say a medium sized blue pottery candle holder may be priced between Rs.500 to Rs.600.